Recent questions in TechNet Forums reminded me of an issue faced when building large file servers running on Windows Server 2008 R2. By large I mean serving a lot of files, from thousand to millions or more. There is very little you can do to work around this issue except adding more RAM to the server. 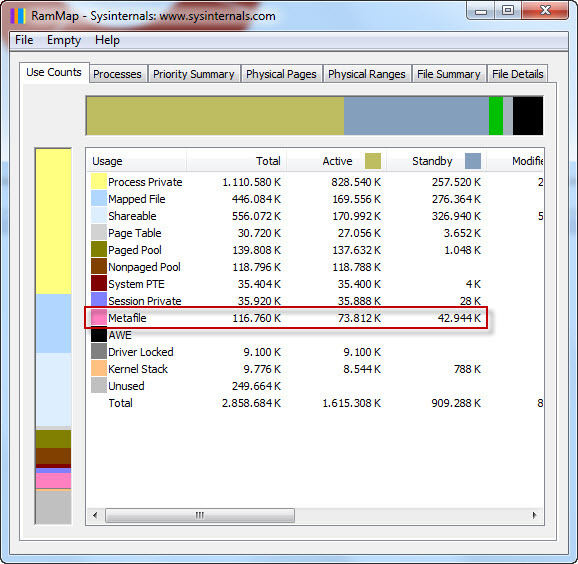 Since the amount of memory used depends on the size of files served and the number of files (Metadata), the amount of RAM needed can be relatively easily although roughly calculated. While you can control the amount of memory used by the file system cache, you can’t prevent the metafiles from being cached. Finally, a safe way not to get caught by surprise by this behavior once your file server is running in production is to benchmark it beforehand using the File Server Capacity Tool (FSCT). Categories: Capacity Planning, File & Print Services, Memory, Performance, Windows, Windows Internals, Windows Server, Windows Server 2008/2008 R2 | Permalink. Microsoft has finally releases a truly great document late October: Implementing an End-User Data Centralization Solution. This documents covers in a very comprehensive while practical manner everything related to storing, protecting and and making accessible user data using Windows File Sharing. Unlike many white papers out there, this one can be directly used for planning, building, implementing and operating with no room for improvisation. It comes with real-life metrics, group policy settings as well as scripts and tools. Important to mention that it is also 2008 R2/Seven-ready and covers the use of FSCT. Categories: Capacity Planning, File & Print Services, Windows, Windows Server, Windows Server 2008/2008 R2 | Permalink. Since I do not like one-liner posts, I recently started writing an (ambitious?) serie of posts covering enterprise file services based on Windows Server 2008 R2 based on a presentation I gave to certain customers of mine . The first “shot” is dedicated to a new swiss-army knife-like tool from Microsoft: FSCT, standing for File Server Capacity Tool. Architecturally speaking, FSCT is similar to other load-tests tools you would use of web application, for example: it is made of a controller, a server (the one to be benchmarked) and one or multiple clients. Optionally, you can also include an AD domain controller in the picture in order to simulate AD-based authentication. Nevertheless, FSCT is also compatible with workgroup environments, but in a degraded manner. Note: Combining roles is a possibility but as you expect, it may negatively affect the tests. So if you’re short on machines, combine wisely and keep the other roles off the “server” role. On the other hand, you can conduct test campaigns from more that one client simultaneously, that’s where the architectural choice is paying: up to my knowledge, no other tool can do that today. What do you get from the tests? Can FSCT work against DFS-N: yes it does. But it will not allow you to stress-test the DFS part of your design since it has no knowledge of it and does no embark any technology to capture DFS’ behavior during the load test. Moreover, it may require to configure the “server” part as if it was a non-Microsoft file server (see below for details). Moreover, capturing performance counters on the server using FSCT itself might be an issue, the workaround being the good old “manual” capture using perform or logman. Using FSCT against a failover cluster works perfectly but with one limitation identical as above: the tool will ne be able to collect performance counters directly. Instead, you will have to plan for manual capture on the node designated as owner of the file share resource, or on both if you wish to perform failovers during the tests. ls available and during the test I lead Cacti was very helpful. Well, not 100% ready yet. The only workload scenario available at RTM release time being “Home Folders”, you might not be able to validate your setup realistically. But according to MS, an SDK is on the way in order to allow the creation of custom workloads. In the mean time, you can already start playing with the tool itself and with the customization of “HomeFolder” profile config file but you will not go far with that. In a coming post I will cover practical usage of FSCT. Categories: Capacity Planning, File & Print Services, Tools, Troubleshooting, Tuning, Windows Server, Windows Server 2008/2008 R2 | Permalink.